The Fiat 500 European tour triumphs at MediaStars, the prestigious advertising industry competition. Two golds awarded in the “Event” and “Mediastar/Promotion” sections. So far the project has received 13 national and international trophies. Now in its eleventh year, the 500* has scored its best performance ever with over 74,000 cars sold across Europe in the first months of 2018. The awards ceremony for MediaStar, which aims to showcase the professional skills of those who contribute their technical expertise to the success of an advertising project, was held yesterday evening in Milan. Hosted by the Auditorium Testori, the event was attended by a large number of advertising agencies, production companies and audiovisual post-production and web-factoring firms. The independent competition, which is in its twenty-second year, is divided into four different areas, which cover various fields of advertising, broken down into 12 sections each. The judges awarded two first places, in the “Event” and “Mediastar/Promotion” sections, to the “Forever Young Tour Experience” European tour which celebrated Fiat 500’s 60th birthday last year. This means that the project, created by the Ideal agency, has now totalled 13 national and international trophies. Last year it reproduced the mood of 1957 in three cities – Cannes, Munich and Madrid – to celebrate the 60th birthday of the Fiat 500 and recreate a genuine journey through time. Each leg of the tour fully expressed the local culture of the chosen locations. It ended in Madrid with a jaw-dropping event featuring nearly one hundred actors and extras in full costume, charming vintage shops representing some Italian-made excellences in areas of fashion, food and design, and classic Fiat 500 cars. The undisputed star of “The Fiat 500 Forever Young Experience” project was the 500 special edition dedicated to the 60th anniversary. It paraded along the seafront at Cannes – the French town famous for its International Film Festival – just like a movie star, greeted by thousands of tourists who never stopped photographing it. It received the same kind of ovation on the distinctive Wiener Platz in Munich, one of the Bavarian city’s most famous locations, with its small permanent market and the nearby Hofbräuhaus beer-cellar. Over seven thousand visitors thronged in the lively Calle Jorge Juan da Calle de Serrano, one of Madrid’s biggest urban entertainment areas, lighting it up with the flashes of their cameras and smartphones to take shots of the car, produced in a numbered limited edition, as well as the splendid set created to showcase the timeless Italian icon. The bond between the Spanish capital and the Fiat icon is so strong that it was chosen as the culmination point for another European tour on 23 May this year. This tour visited some of Europe’s most prestigious cities: from Milan to London and from Berlin to Paris, then on to Madrid. The star of this journey was the irresistible 500 Collezione, the thirtieth of the special editions launched over the past 11 years. The 500 Collezione is already in Fiat showrooms across Europe. Fiat 500 has always been a trendsetter, while remaining true to itself and has been re-interpreted over time, linking its name to iconic brands from the worlds of fashion, luxury yachts, arts and sports, in an array of special editions created to explore unusual territories for a city-car. Launched in 1957 and asserted over the years as the symbol of mass motorisation in Italy, Fiat 500 was reborn in 2007 when the new model debuted – and went on to become a global phenomenon. This is demonstrated with over two million cars sold in over 100 countries worldwide. 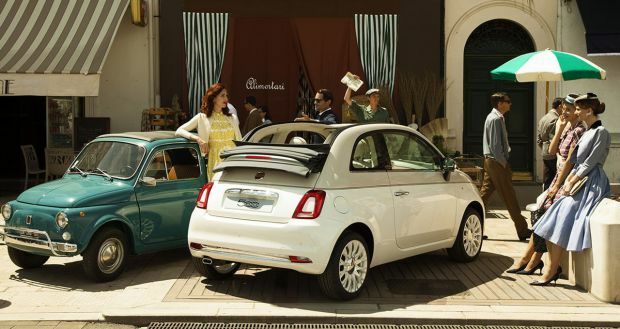 Over 80% of sales are outside of Italy and the 500 has been the best-seller in its segment in Europe since 2013. In the first four months of 2018, the 500 was the market leader in nine countries (UK, Spain, Belgium, Switzerland, Portugal, Austria, Hungary, Croatia and Slovenia) and in the top three in seven others (Italy, Germany, France, Sweden, Slovakia, Romania and Bulgaria). Also in the first four months of 2018, in its eleventh year, the 500* broke its own record with over 74,000 cars sold in Europe.